What you need to know about iOS 9 and the backup of iPhone apps? Starting with iOS 9 and further, Apple has restricted what iPhone and iPad users can do with their apps. Back in April 2015, we saw the backup of app preferences and game scores being scrapped. Today you are no longer able to back up iPhone and iPad apps to your PC at all. CopyTrans Shelbee remains a user-friendly solution for iPhone backup and restore without iTunes. For iOS 9 users, we had to disable the extra-feature of iPhone app backup. can no longer back up iPhone apps. Since 2004, CopyTrans continues to help hundreds upon thousands of users to copy iPhone music and playlists to PC. CopyTrans was the first of our programs where we introduced iPhone app backup as an accessory feature due to numerous user requests. 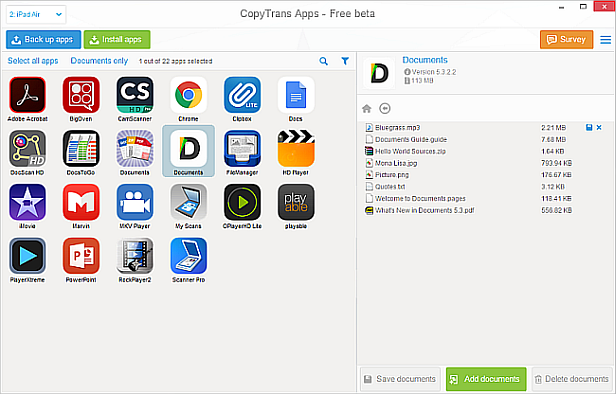 While, CopyTrans remains the tool of choice for copying iPhone and iPod songs, video and playlists to PC, we disabled app backup in CopyTrans for iOS 9 and iOS 10 users. Why did Apple scrap app backup as of iOS 9? We can only guess. This could be a logical step toward increased security and toward ensuring that iPhone users run the latest app versions downloaded from the App Store. On the other hand, the limitation is another step backwards toward decreased flexibility and less freedom for iPhone end users. iOS 11 is deemed to be the most advanced iOS version to date. Yet the little control iOS users had over apps installed on their very own devices has dwindled. Share your thoughts with us; what do you think about the new iOS limitations? Tell us in the comments section below.